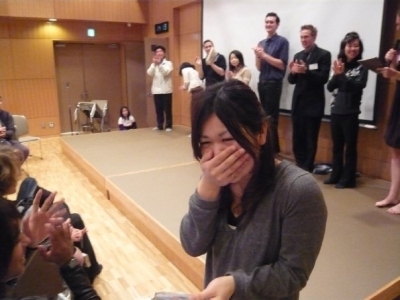 On April 13th, the World Campus — Japan Spring of 2008 class celebrated a successful completion of the program during a graduation ceremony which was held in Komorebi (sunlight through the trees) Hall in Abiko city, Chiba prefecture. The 16 participants of the third session came to the hall accompanied by their host families who acted on behalf of their real families. The host families and Abiko local organizing committee kindly brought home made dishes, some of them cooked in cooperation with our participants – such as Norwegian rice pudding and American rhubarb cake to name a few. After we all enjoyed the hearty meal, each participant went on stage to receive their certificate of completion. Every single one of them was cheered by passionate families and fellow classmates. The ceremony was followed by an educational session to prepare them to go back to their own culture as well as by an evening of fun Karaoke too! 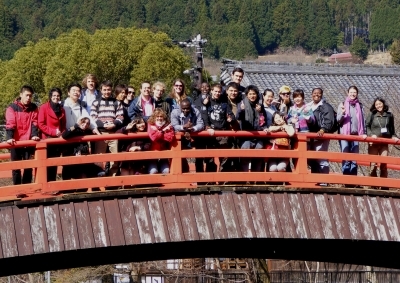 On the next day, the second World Campus – Japan tour officially came to an end. The wonderfully talented participants from 14 countries said “see you soon” to each other at the New Tokyo International airport rather than saying “good-bye”.